Everyone is invited to a delicious pancake breakfast at the KC Hall, 1910 South Greeley Street in Stillwater, Sunday, Aug 19 from 8:00 AM - 1:00 PM. 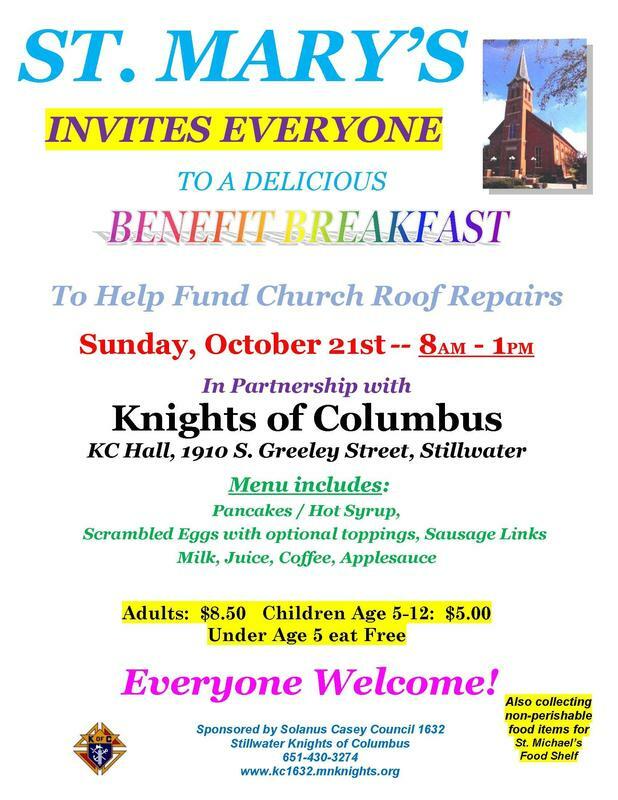 This breakfast is in partnership with St. Mary’s Church to help fund their “Church Roof Repairs” project. Adults are $8.50; children age 5 - 12 $5.00; under age 5 eat free. Ample parking and wheel chair accessible. Bring your family & friends and an item for the St. Michael's Food Shelf. Open to the Public -- All are Welcome. Sponsored by the Solanus Casey Council #1632 Stillwater Knights of Columbus. Volunteers are needed!!!! Shifts are 7:45-10:00 am, 12:00 am-noon and noon-1:30 pm. Please contact Liz Junker at 651-269-2966 or ljunker@costm.org if you can help.